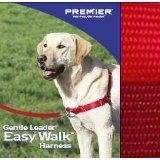 Gentle Leader Dog Collar Or No Pull Dog Harness - Makes Leash Training A Puppy Or Older Dog A Lot Easier. Find the Gentle Leader dog collar or no pull dog harness to help you gently train your dog how to take a walk calmly without struggling. Walking your dog should be an enjoyable experience, not a battle of tugging and pulling. The Easy Walk harness with a front leash attachment, will enable you to discourage your dog from pulling on a walk. It's easy to use, gentle and simple to fit. When you use a no pull dog harness, you don't have to worry about pressure on your dog's neck or trachea because it is designed to sit below these areas. As a result, you will be relieved to see that your dog is not coughing or choking as is often the case with some other types of dog training leashes. 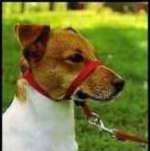 Another version of the harness, comes with a dog head collar that teaches your dog to sit/stay in one lesson, as well as provides a DVD training guide for other day-to-day behavior you want to teach your dog in a gentle manner. Below you will see a selection of Gentle Leader dog collar and no pull dog harness products available through our association with Amazon. To buy or get more product details, just click on the item. Because we look for reliable sources to purchase dog supplies, we have partnered with this great merchant for secure transactions and so that we can provide the product links right here on our website for your convenience.